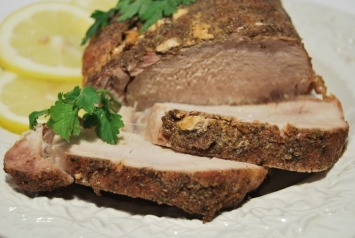 This is a delicious pork roast recipe, one of the best I have found. It is moist and tender. If you like garlic pork, you will love the added twist the lemon gives it. Trim excess fat from pork. Stir rest of the ingredients except the chicken broth together well and rub evenly over the pork. Place pork in small roasting pan or casserole and add broth to the pan. Bake at 400° for 30 minutes. Turn pork over and bake for an additional 35 minutes or until a meat thermometer registers about 160°. Serve, making pan juices into a gravy if desired. You don’t need to use a pork loin roast here. Substitute any other pork roast cut you prefer. It will taste just as good. And both lemon and garlic are extremely healthy for us. Find out why here. You’ll find that cooking pork loin roast is quite easy. I don’t eat much pork, but from a carb point of view, this is a very good diabetic recipe because it’s very low carb. The garlic and lemon are really good for us too. To find other garlic recipes as easy and delicious as this lemon garlic pork roast recipe, look here. I have this in the oven right now and it smells so good!! The juice on the bottom tastes amazing and I can’t wait to make the gravy! Along side I’m making garlic mashed potatoes and broccoli mmmmmm, can’t wait till supper! !